We know that what is now 30 Castle Street in Thornbury is a particularly old house and that it is certainly older than at least one of its neighbours (number 32). 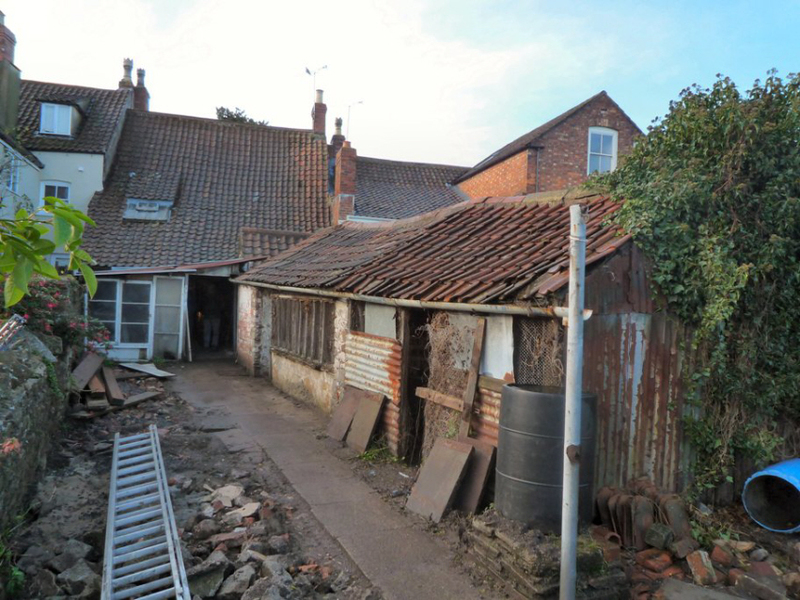 In recent years it has been completely renovated and modernised but the photograph on the right showing the rear of the property before this work was undertaken gives an impression of very rural and rather old structure with its pig sty and chicken sheds. The garden was very long and fairly wide so the property was used used almost as a market garden at one time. We have had no access to the deeds of this property and our account of its earliest history can only be based on records such as wills or tax records. This means we cannot always be certain that the information we have found relates to this property although we have made every effort to confirm our findings where possible. This means the property that became 30 Castle Street was at one time occupied by James Eley (see below). The records of the tax payable for the Poor Law in 1727 show that James Eley was assessed to pay one and half pence for a part of a property described as “Cannings”. It is interesting to note that two people next to him on that list, Thomas Clark and John Cox, were also each due to pay 2d for “part of Cannings”. In 1717 the Poor Law Assessment appears to show Anna Cannings was due to pay a total of five and half pence for the whole property. 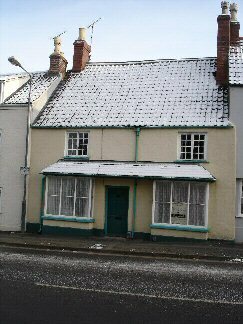 We feel that it is likely that James Eley had acquired his property in Castle Street from the family of Joseph Cannings. It is not possible to make any definite statement at this stage as to whether there was a house there at that time, although its present owners says that the style of building visible in the roof beams and the floorboards suggests that it is old enough. Nor do we know how or why the property was divided into three lots. We do however have some confirmation that there was a large holding of land in this area of Castle Street and that it was owned by Joseph Cannings. The Tithe Terrier of 1696 refers to “one ground of severall acres purchased of severall persons and inclosed this yeare by Joseph Cannings out of Tiltfield.” We do not know the full extent of what was called Tilt Field but we do know that this name was given to a very large area of land running behind Castle Street which extended down to the road to the church and up to what is now the Gloucester Road and apparently extended to the other side of Gloucester Road as well. In the context of the information given on the Tithe Terrier the area of Tilt Field enclosed by Joseph Cannings in 1696 was in the region of that end of Castle Street where number 30 now lies. It is not possible to be more specific without further research. Moreover, it seems unlikely that the Joseph Canning who enclosed part of the Tilt Field was the same one whom we describe below. It is more probable that he was an older generation, possibly his father. We know that there was an older Joseph Canning, presumably the father of this one and that he seems to have been living in Thornbury about 1670, probably in a property near the corner of the High Street and The Plain which was later divided into 1, 3 and 3A High Street. We know that the Joseph Canning (mayor of Thornbury in 1693/4) who we believe owned the property in Castle Street that became number 30 was first married to Mary Barton. The Quaker records show Joseph was then a victualler or butcher. According to the Quaker custom, they manifested their intentions to marry at a meeting in Frenchay on the 10th day of the first month 1694/95. These intentions were published at Thornbury on the 9th day of the fourth month 1695. Mary was baptised on 16th May 1667 at Thornbury. She was the daughter of John Barton and his wife, Mary (nee Mary Thurston). A son, another Joseph Canning was born in Thornbury the 10th day of the sixth month 1696 (on 10th August 1696). This birth may well have caused the death of the mother. It seems that the marriage of Joseph and Mary Cannings was very short indeed. Thomas Barton’s will of 1700 left money to Joseph Cannings and described him as the son of his kinswoman Mary Canning deceased who was the daughter of his brother, John. This means that we know Mary Cannings died before 1700. We have a record of a burial in the Quaker burial ground at Hazel of Mary Cannings the wife of Joseph Cannings the younger on 26th August 1696. Joseph then appears to have re-married. We believe he married Anne (or Anna) Piper in Thornbury on 18th June 1701. In 1710 and 1711 the Overseers reports show that Joseph Canning had to pay tax of five and a half pence for a property probably in Castle Street. William Ockford was paying 1d for the neighbouring property which was described as “Mabbotts”. Mabbot is a name that recurs in connection with Joseph Canning. Joseph’s will says that if his own son were to die before he inherited his properties, the children of his brother John Mabbott then deceased would inherit. The same will also refers to his (i.e. Joseph Cannings) brother Thomas Mabbott. We know that John Mabbbot owned neighbouring property to Joseph Canning. However we have no explanation as yet for their apparent relationship . The will that Joseph Canning made in 1711 confirms that he had a son called Joseph Cannings who was then under 21 years of age but who would eventually inherit two properties and who would presumably benefit from the trust set up with funds from a third property. We suspect that this refers to one of the properties on the west side of the High Street or southern side of Chapel Street which were situated in Kington abutting the Borough of Thornbury. We believe that Anna Cannings died in 1724 and was buried at Frenchay on 17th November 1724. It seems possible from the Overseers’ records of 1724 that the Cannings property was divided and part may have been sold off as three people were each showed to be paying tax for ‘part Cannings’. Joseph Canning (presumably Anna’s son) was one of these people until about 1728. We do not know what became of Joseph Cannings. James Eley. In 1711 the Overseers Accounts show that James Eley was assessed to pay 1d for a property in Thornbury. This was a different property from the one owned by Joseph Cannings but we cannot determine where it was. By 1720 the Overseers’ Accounts were showing a joint liability of Anna Cannings and James Eley of five and a half pence. Possibly James Eley was a tenant of Anna Cannings at this time. After Anna Cannings’ death in 1724 the Overseers’ Accounts suggest some division of the Canning property. Joseph Cannings (presumably the son) was now liable for two pence, James Eley for one and half pence and John Cox two pence. James Eley seems to have been occupying a property in Castle Street that later became number 30. This appears to be confirmed by documents relating to the Malt House that we believe occupied the neighbouring property because these documents refer to James Eley. We are grateful to Richard Barton for a great deal of the information about this family which we have used in the following paragraphs. James Eley was probably baptised on 18th January 1688 in Thornbury. It seems that on 21th April 1720 the Bishop’s Transcripts record the marriage of James Eley with Elizabeth Morgan at Thornbury and this was the same year that James Eley, a Sartor or Taylor, was to take over a tenement, garden and orchard which had been held by the Cannings Family and had a connection with John and Judith Bradley. James and Elizabeth Eley had three children – Hannah who was baptised on 30th March 1724 at Thornbury and later married Richard Scarlett; the elder James, who was baptised in 1727 and buried in 1730 and James who was born in about 1736. We know from the documents that relate to the neighbouring property that by 1752 James Eley no longer lived here and that it was now the home of a widow called Elizabeth James. We do not know when James Eley and his family moved away from Castle Street. They appeared to be still in this property in the Overseers Accounts for the whole period 1733 to 1753 but this may imply only that he owned the property not that he occupied it. It may be relevant that James Eley was Overseer for the Poor in Kington in 1735/7. We know from Richard Barton’s comments about the Manorial Records’ of his death that James Eley lived in Kington in his later years. Elizabeth James. By 1752 the house that became 30 Castle Street was described in a document relating to the malt house as one “wherein James Eley formerly inhabited and now in possession of Elizabeth James widow.” Sadly we know nothing at all about Elizabeth James but she may have died in 1759 aged 52 and buried in Thornbury on 29th April of that year. John Longden junior. In 1766 the same property was said to be north of “the house wherein James Eley formerly inhabited and now in the possession of John Longden junior.” We do not have sufficient information at present to identify this John Longden. The next source of information about this property is the tithe map and the accompanying tithe apportion. These show that this property was occupied by William Wathen and owned by William White. William White. At this stage we know nothing of William White and would like to learn more. It is interesting that the records for land tax payable in Thornbury for 1832 (the next records we have before 1840) do not show William White at all and we are unable to trace him in the 1841 census. William Wathen. The census of 1841 is the first document to give us details of the occupants of the house which was occupied by William Wathen aged 35 a beerhouse keeper. He was living with his wife Ann also aged about 35 and their children Clarissa 12, William ten, George eight (not born in County), Harriett six, Edwin four, Hugh two and baby Eliza aged two months. It is interesting that the 1841 census shows William as beer house keeper. Number 30 Castle Street would have been a “two guinea beer house”. Under a Licensing Act of 1830 anyone of good character could open a beerhouse for a licence which cost only two guineas. After this Act Thornbury had quite a number of such places. To curb the rate of beerhouses opening, the licence was increased to three guineas in 1834 and by 1841 the rateable value of the premises had to be above £8. This led the closure of many beer houses. William Osborne. By the 1851 census there was another tenant. William Osborne was aged 57 and a carpenter journeyman. He was living with his wife Ann from Cam who was a laundress aged 52. They had a daughter Rebecca aged 23 who was a laundress too. They also had a son Charles aged 14 a sawyer and a servant Elizabeth Ricketts aged 14. In 1841 this family lived in Sibland with children John 20, Charles 10, Eliza 15, Rebecca 13 and Mary 7. Rebecca and Anselm Harvey. William and Ann Osborne’s daughter Rebecca married Anselm Harvey in the December Quarter of 1853. The 1841 census shows the Harvey family living in Gillingstool, not far from the family of William Osborne. In the 1841 census Anselm Harvey was a 15 year old mason and the son of George and Catherine Harvey. We believe that the cottage in which the Harveys lived was shown on the Tithe Map as property number 527 and appears to have been owned and occupied by George and his family. We have called this property “the Roberts house” as it was never given a name or house number. Anselm Harvey had first married Maria Poole, daughter of Thomas Poole, labourer on 10th April 1847. However Maria died a few years later and was buried on 5th October 1850 aged 33 years. In 1851 the census shows that Anselm Harvey, then widowed, and his son Henry aged two were living with William Harvey the blacksmith brother of Anselm in Gillingstool Cottage. The 1861 census shows that the Osbornes were still living at 30 Castle Street. William was 67 and a carpenter and Ann was 62 and a laundress. It is possible that the Harvey family lived with them even at this stage, although they are shown as two separate households. This census shows that Anselm was a mason, Rebecca was still a laundress, presumably working with her mother and they had a young son, Henry aged 11. William Osborne died 20th August 1867. In the rate book of 1867 the name of William Osborne is crossed through and the name of Anselm Harvey was written in. In the 1869 and 1871 rate books Anselm Harvey occupied the house and garden. However the 1871 census shows that Ann Osborne had remained in the house. The head of household was Anselm Harvey aged 48 a mason born in Thornbury. His wife Rebecca was 43 and born in Cam as was her mother Ann Osborne (who is described on the Census as mother of wife). Ann Osborne died 22 April 1878 aged 79. In the 1876 rate book Anselm Harvey was the occupier of 30 Castle Street but William White was still the owner. By 1877 William White had died but Anselm was still the tenant. In 1878 and 1880 “Mrs White” now owned it. In the 1881 census Anselm and Rebecca Harvey had their eight year old granddaughter living with them. Anselm was a stone mason employing two men and Rebecca was still a laundress. The Thornbury Grammar School records of 1881 show that Mrs Harvey was cleaning the schoolroom and laying the fire. Anselm died and was buried on 25th January 1883 aged 59 years. He was buried in the same grave as Maria, his first wife, in St Mary’s Churchyard in Thornbury. The rate book of 1885 show that 30 Castle Street was now owned and occupied by Rebecca Harvey. In the 1891 census Rebecca Harvey was a widow aged 63 and still a laundress but she was living with her granddaughter Ada Rebecca Harvey who at that time was 19 and a pupil teacher at a Board School. The above image shows a receipt dated 1872 for payment by Henry Howard of Thornbury Castle of his bill for Rebecca’s washing services. Rebecca made her mark as she was presumably unable to sign her name. On 30th April 1900 Ada Rebecca Harvey the 28 year old daughter of Henry Harvey and granddaughter of Rebecca married Frederick Workman a 31 year old bachelor from Sparkbrook in Birmingham. Frederick was a guard on the Midland Railway. His father George was also a railwayman. By 1901 the census shows that Ada by then 29 and her husband Frederick aged 32 had gone to live in Balsall Heath in Birmingham and her 73 year old step-grandmother Rebecca Harvey was with them. The Thornbury Parish Magazine dated February 1901 notes that Rebecca had given up her role as Assistant Sexton which she had had for so many years. She was presented with a purse containing 10 guineas and an album containing the names of the contributors. The 1901 census appears to show that the house is void. Presumably the new owners had not yet moved in.